It's all about baby steps in this world of freelance writing. 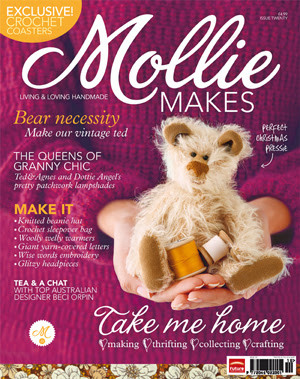 My two-paragraphs' worth of copy pertaining to the wonderful Barley Massey of Fabrications (deep breath) can be found in this month's Mollie Makes (p. 53 if you'd like to know)! My two paragraphs are now preserved for all eternity in the bowels of the British Library. Not even my doctoral thesis has made it there yet. Cue some sort of impromtu Morris Dance of delight. And I think another cymbal crash for good measure.